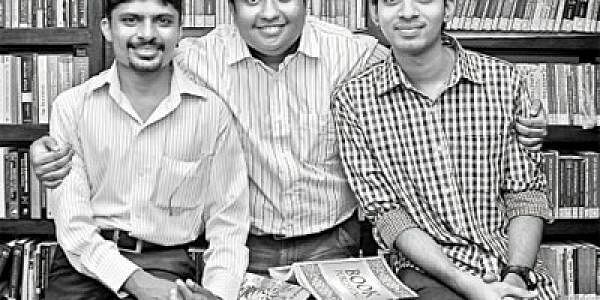 What is common to Chetan Bhagat, Amish Tripathy and Sidin Vadukut?” asks Naveen Valasakumar, co-founder of Notion Press, a six-month-old new age publishing company. He pauses and answers, “They engage their readers”. invest in the author who is approaching him, and the state of self-publishing does not give an author the desired outcome. Notion Press is filling&nbsp; the gap between these two choices,” says Valasakumar. the book’s distribution globally,” explains Valasakumar. And how is all this happening? “We have developed a user interface which basically automates all these processes. So what a publisher is paying heavily for is done at the click of a mouse here,” says Bhargava, who is an ace software developer. Automation is at the core of Notion Press — the technological edge has helped them cut costs of publishing by a large margin. “We are helping create the next best-selling author,” says Bhargava nonchalantly. Is it really that simple? “Once a book is published as per the author’s preferences (e-pub, PDF, online retailers or traditional publishing), the book goes through three stages — the embryonic stage (where we get peer reviews), start-up (we observe through analytics how the book is doing in various fora) and finally the growth stage where the author knows where he is doing (e-pub, PDF or online retail) well. We now get a venture capitalist or someone who is willing to fund the publication of the book on a large-scale,” shares Valasakumar. Notion Press currently works with freelance proofreaders and copy editors on a book-on-book basis. “Our investment was majorly on computers, servers and the technology side of publishing. The investment so far has been `3.67 lakh. It is of great help that Janarthanan’s father has been in the publishing industry for 30 years,” says Valasakumar. The team tells us that with Notion Press, the cost of publishing a book comes down to one-third the cost of a self-publisher. A self-publisher would at least spend Rs 55,000 excluding the printing cost of the book. Three authors have signed up for the author-incubation programme, which will take them from the initial stages of getting the book ready to proofing/editing, marketing and selling the book. “The books (Oath of Hippocrates, Live from Mumbai and an untitled work) will be out in 30 days,” says Valasakumar. “As an author, one will have to invest in his book and we will co-invest with him. This will ensure that he is committed to the project and plays along with us for marketing and publicity-related work,” says Janarthanan. The investment completely depends on the number of pages in the book. They have tie-ups with 500 dealers, mostly online retailers like Flipkart and Amazon. Notion Press intends to only share profits with the author. This ratio is now 50:50. “We have received 16 new manuscripts through our online short-story contest, which has now gone viral,” says Valasakumar with a hint of pride. Bhargava sums it up, “The barrier to entry in this field is very high, so we are just making a little easier for newcomers to settle down.